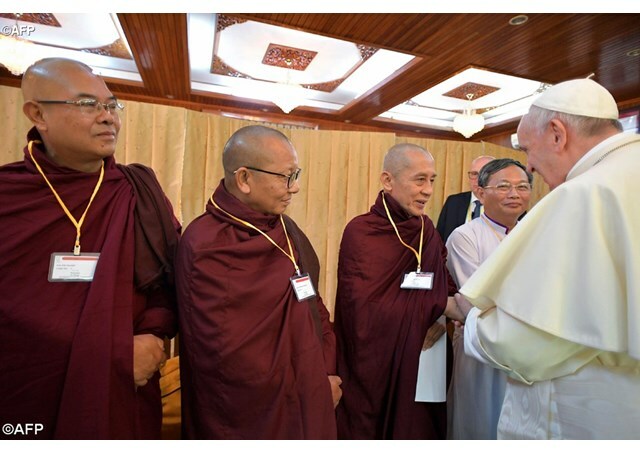 Radio Vaticana Report: Pope Francis on Wednesday addressed the Supreme Sangha Council of Buddhist Monks at the Kaba Aye Center in Yangon during his Apostolic Journey to Myanmar. It is a great joy for me to be with you. I thank the Most Venerable Bhaddanta Dr Kumarabhivamsa, Chairman of the State Sangha Maha Nayaka Committee, for his words of welcome and for his efforts in organizing my visit here today. In greeting all of you, I express my particular appreciation for the presence of His Excellency Thura Aung Ko, Minister for Religious Affairs and Culture. In every age, humanity experiences injustices, moments of conflict and inequality among peoples. In our own day these difficulties seem to be especially pronounced. Even though society has made great progress technologically, and people throughout the world are increasingly aware of their common humanity and destiny, the wounds of conflict, poverty and oppression persist, and create new divisions. In the face of these challenges, we must never grow resigned. For on the basis of our respective spiritual traditions, we know that there is a way forward, a way that leads to healing, mutual understanding and respect. A way based on compassion and loving kindness. I express my esteem for the all those in Myanmar who live in accord with the religious traditions of Buddhism. Through the teachings of the Buddha, and the dedicated witness of so many monks and nuns, the people of this land have been formed in the values of patience, tolerance and respect for life, as well as a spirituality attentive to, and deeply respectful of, our natural environment. As we know, these values are essential to the integral development of society, starting with its smallest but most essential unit, the family, and extending through the network of relationships that bring us together – relationships rooted in culture, ethnicity and nationality, but ultimately in our common humanity. In a true culture of encounter, these values can strengthen our communities and help to bring much needed light to wider society. The great challenge of our day is to help people be open to the transcendent. To be able to look deep within and to know themselves in such a way as to see their interconnectedness with all people. To realize that we cannot be isolated from one another. If we are to be united, as is our purpose, we need to surmount all forms of misunderstanding, intolerance, prejudice and hatred. How can we do this? The words of the Buddha offer each of us a guide: “Overcome the angry by non-anger; overcome the wicked by goodness; overcome the miser by generosity; overcome the liar by truth” (Dhammapada, XVII, 223). Similar sentiments are voiced in a prayer attributed to Saint Francis of Assisi: “Lord, make me an instrument of your peace. Where there is hatred, let me sow love. Where there is injury, let me bring pardon… Where there is darkness, let me bring light, and where there is sadness, joy”. May that wisdom continue to inspire every effort to foster patience and understanding, and to heal the wounds of conflict that through the years have divided people of different cultures, ethnicities and religious convictions. Such efforts are never solely the purview of religious leaders, nor are they the competence of the state alone. Rather, it is the whole of society, all those present within the community, who must share in the work of overcoming conflict and injustice. Yet it is the particular responsibility of civil and religious leaders to ensure that every voice be heard, so that the challenges and needs of this moment may be clearly understood and confronted in a spirit of fairness and mutual solidarity. I commend the ongoing work of the Panglong Peace Conference in this regard, and I pray that those guiding this effort may continue to promote greater participation by all who live in Myanmar. This will surely assist the work of advancing peace, security and a prosperity inclusive of everyone. Indeed, if these efforts are to bear lasting fruit, greater cooperation between religious leaders will be required. In this, I want you to know that the Catholic Church is a willing partner. Opportunities for religious leaders to encounter one another and to dialogue are proving to be a notable element in the promotion of justice and peace in Myanmar. I am aware that in April of this year the Catholic Bishops’ Conference hosted a two-day peace meeting, at which leaders of the different religious communities took part, together with ambassadors and representatives of non-governmental agencies. Such gatherings are essential if we are to deepen our understanding of one another and affirm our interconnectedness and common destiny. Authentic justice and lasting peace can only be achieved when they are guaranteed for all. Dear friends, may Buddhists and Catholics walk together along this path of healing, and work side by side for the good of everyone who lives in this land. In the Christian Scriptures, the Apostle Paul challenges his hearers to rejoice with those who rejoice, while weeping with those who weep (cf. Rom 12:15), humbly bearing one another’s burdens (cf. Gal 6:2). On behalf of my Catholic brothers and sisters, I express our readiness to continue walking with you and sowing seeds of peace and healing, compassion and hope in this land. Once more, I thank you for inviting me to be with you today. Upon all of you I invoke the divine blessings of joy and peace.